When we think about World of Warcraft we all think about how it is, ultimately, the end all everything of MMOs. It is the MMO that made the genre popular with the masses and, in my opinion, opened the entire world up to online gaming. WoW has synergized with all sorts of genres, making MOBAs popular (considering WarCraft III was not only the founding grace of MOBAs but they’ve also served as a great “down time” game for the WoW masses). So comparing anything to is difficult, just on the basis of scale. However, with Final Fantasy XIV: A Realm Reborn I can say that comparison can be made, rather easily, just on the shear sustained popularity of the game. FFXIV has had an overly successful launch, much like Star Wars: The Old Republic and Guild Wars 2, except it has something a bit different. Unlike SWTOR, they didn’t immediately rush out and open swaths of new servers in order to sate the initial rush, stranding thousands on worlds far far away from anyone else. Unlike GW2, FFXIV isn’t a supplementary game. This isn’t to rag on GW2, nay, but GW2 operates as a game to be played in supplement to others (in my opinion). Many of my friends play both GW2 and WoW, opting to log on to GW2 during WoW downtime. 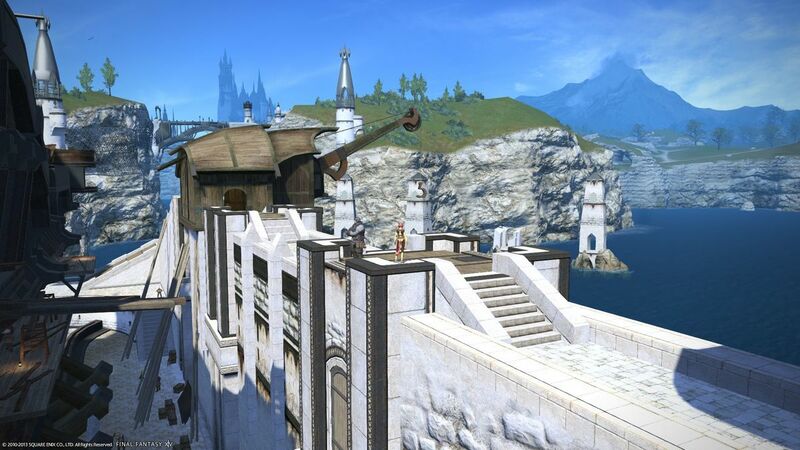 FFXIV is a legit contender when it comes to WoW and rightfully so. FFXIV has a lot of things in it so similar to WoW we might as well brand the games World of Final Fantasy. I honestly don’t even know if I should talk about the similarities because, to be honest, it’s a true WoW clone, well WoW & GW2 clone. I’ve made mention of this before, but most of the major systems are direct correlations to those two games. However, where they are different is where the true shine is. FFXIV has an engaging story from start to finish. Engaging is in the eye of the beholder, if you don’t like Final Fantasy stories you won’t like this one, but it is there and it’s FF enough. It also has something called the “cross-class system.” I don’t know if that’s the formal name, but it’s what I’m calling it. Basically you can level every class to the max level on one character. The benefit? You can use certain skills between classes fluidly and, in addition, get an XP bonus for leveling up other classes. If they’re below your highest class’s level then you get a boost. The FATE system is interestingly different from WoW, public quests aren’t new to the industry though, and is where a lot of my comparison to GW2 comes in since FATEs are the primary way to level when you’re out of quests or want to save them for other classes you’re going to level. The Grand Companies is a neat way to integrate players into factions. In WoW you’re either with the bad guys or the bad guys who are led by Goku. In FFXIV you’re with the good guys, plain and simple, and get to pick later on which good guys you want to be with the most. The character creation is different, radically so, along with the art direction. Both are cartoony, but FFXIV has a soft anime style to it while WoW has a very hard line American art direction. Character customization in FFXIV is a nice mix between way too many sliders that barely change anything and default classes. The reason I can’t make a call is that I’ve yet to reach the endgame for FFXIV and a lot of features promised have yet to be released. It could be one of those scary situations where the journey is the only adventure. Unlike WoW, where the journey is to get to the actual meat and potatoes, it could be a scenario where leveling other classes is the only thing to do in FFXIV and that can get boring fast. We’re going to have to wait and see which one outlasts the other (hint I’m pretty sure WoW will outlast all of us and then some), but for now I’d highly suggest giving FFXIV a try if you’re a fan of WoW looking for something different (but still more of the same).